I want so badly to believe it's fall except it's not quite there yet and the humidity in Charleston is at four hundred percent so even on a nice 80 degree day it feels like the inside of a volcano. (My obsessive love for the ocean makes it all worth it.) But that will never stop me from loading up on pumpkin and jacking my AC up so I can drink a plethora of homemade pumpkin spice coffee drinks. I thought I'd attempt to make my own after seeing what's actually IN pumpkin spice lattes from SB's..don't worry, I'm not a hater, I still purchase drinks from there on occasion but especially during pregnancy I try to be extra wary of chemicals entering my body. PLUS it's cheaper. So there. 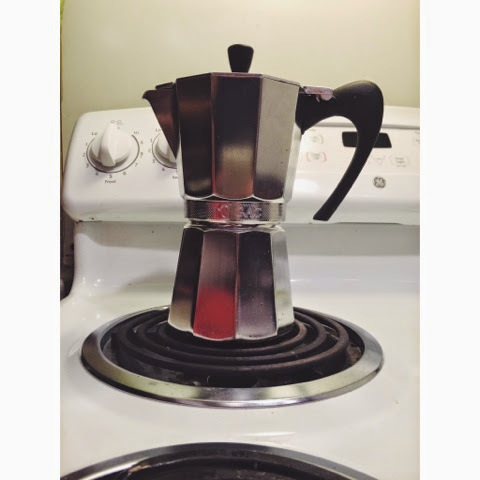 1) Brew your favorite coffee. I think a non-flavored coffee would work best if you typically drink flavored. We don't so I don't know. Maybe someone could experiment and let me know? Maybe there is a magic combination out there that I would have to try! French vanilla? Hazelnut? You guys let me know. We use Rainbow Coffee which is roasted here in Mount Pleasant. 2) After brewed and while still hot, pour into a blender and add 1-2 tablespoons a of pumpkin purée per mug of coffee. I used four heaping tablespoons for 2 mugs worth and it was delicious. I would potentially go stronger but not weaker..but this is all personal preference. 3) Add some cinnamon, sugar (or your preferred sweetener) and some half and half or milk to the coffee and blend it all up. It should be smoothe and frothy in consistency, especially if you used half and half or heavy cream (extra dangerous) to the mix. *i normally don't put sugar or sweetener in my regular coffee these days, but I feel that this drink needs some amount of sweetness to balance out the pumpkin and to have that yummy fall treat feel. But I'm sure it would be enjoyable either way. 4) Pour into a mug and sprinkle some additional cinnamon over top so people think you're fancy. Optional: experiment with other spices (cloves, pumpkin pie spice, etc) and let me know what you love! The best part- one can of purée will last you allllllllll week so you can make these bad boys every single day for a fraction of the cost of buying them.